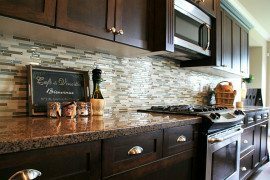 There is nothing more charming and appealing than a beautiful kitchen backsplash that stands out the moment you walk into the space. 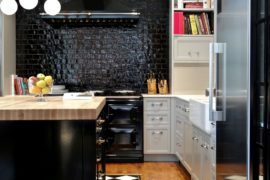 While there are many functional advantages of adding a backsplash to your kitchen, homeowners are now starting to look at this feature as an aesthetic addition that enhances the aura of the kitchen. 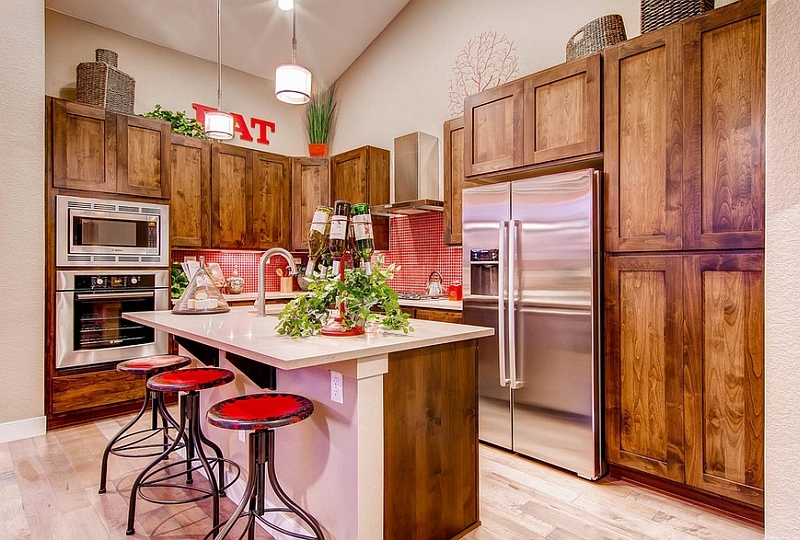 One of the reasons for trendy and hip kitchen backsplashes is the fact that many homes are now happily embracing the open floor plan. 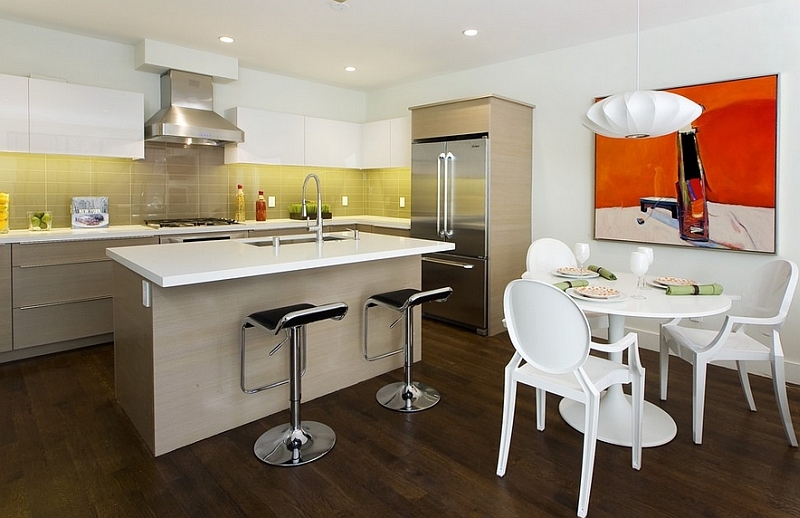 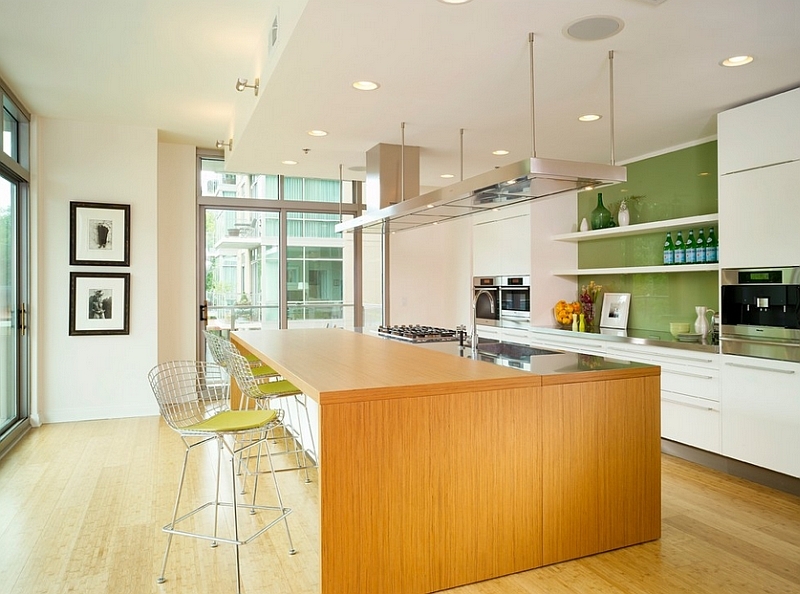 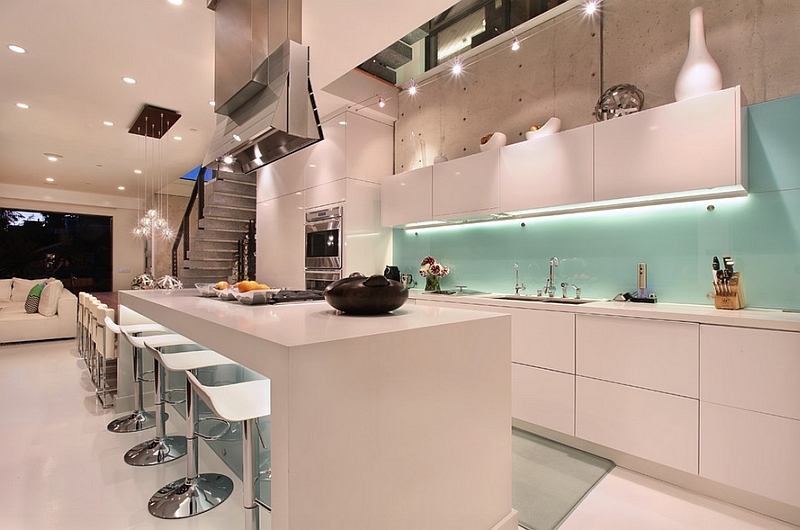 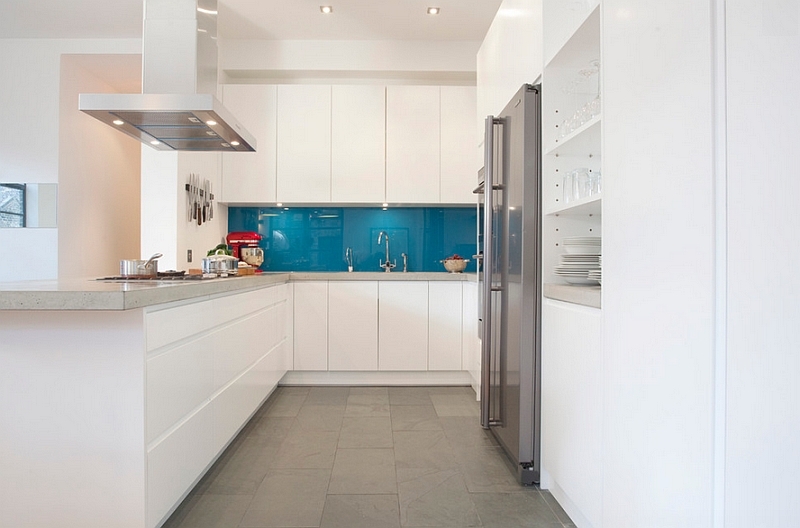 A contemporary kitchen without color looks bland and lifeless. 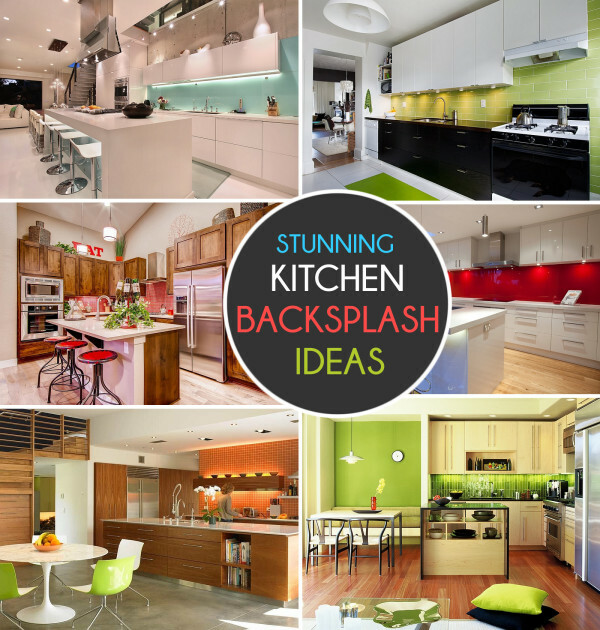 Amid all the white, grey, beige and cream, vivacious colors enliven your stylish kitchen and make it an even more exciting space. 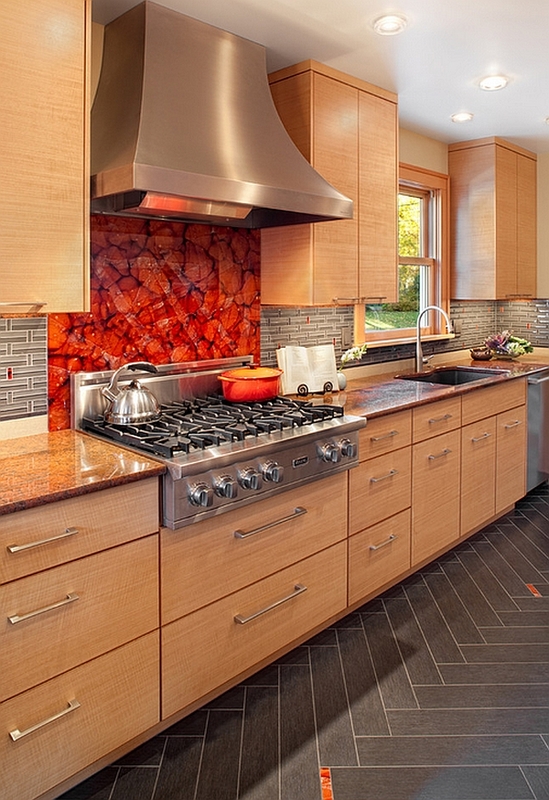 And nothing gets this accomplished better than a brilliant and colorful backsplash! 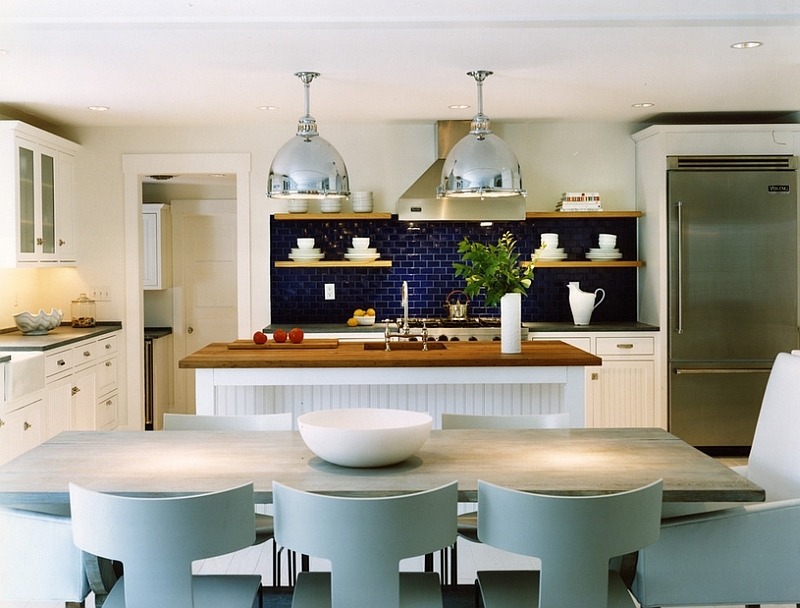 Blue is definitely the most diverse color when it comes to interior design, and its many shades, hues and tints combine to offer you an amazing array of possibilities. 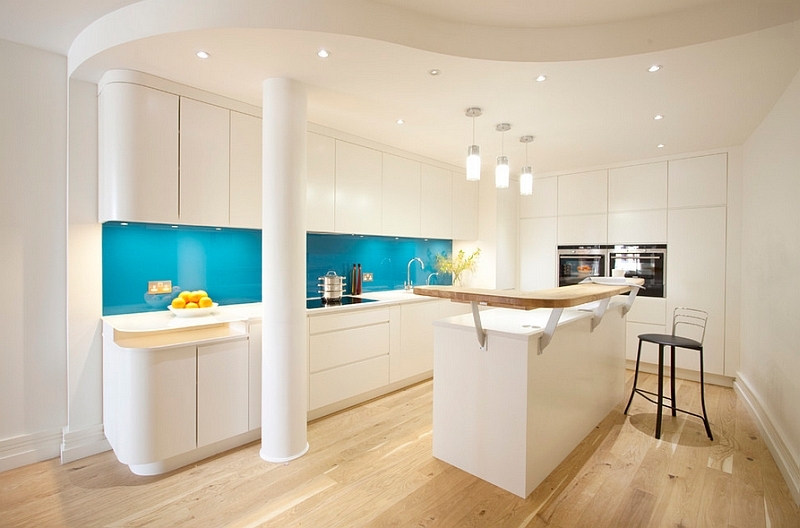 From the stark and dashing cobalt blue to the refreshing turquoise and aqua, the many shades of blue give you a problem of plenty! 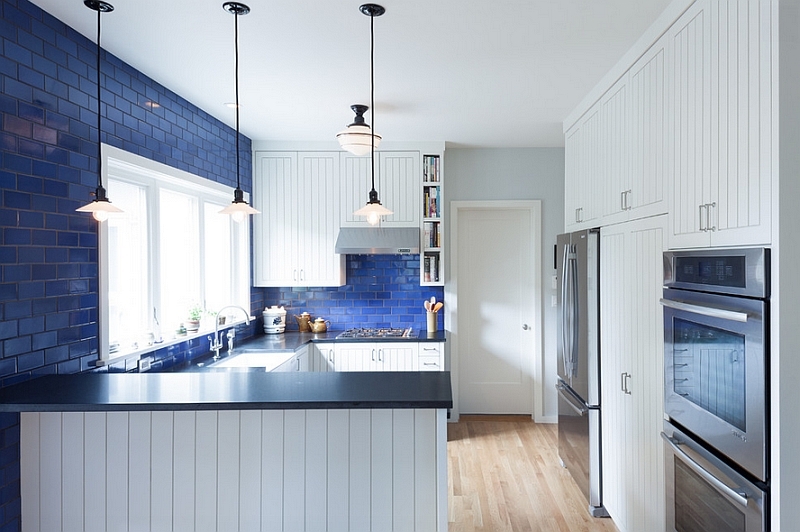 The blue that you choose for the kitchen backsplash must complement the rest of the space and preferably should blend in with the cabinets and the kitchen island. 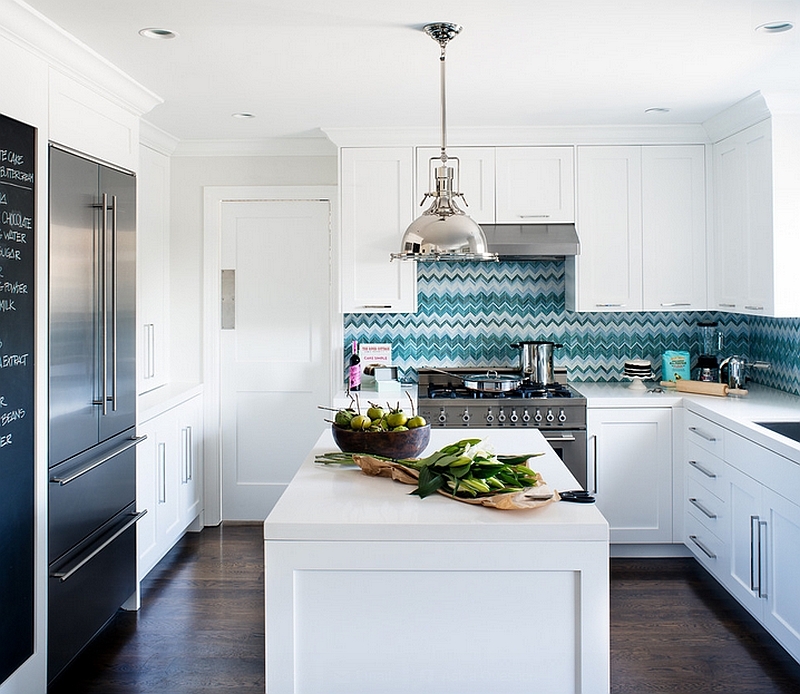 Backsplashes in blue tile usher in a traditional and timeless charm that is ideal for rustic, cottage and farmhouse-style kitchens. 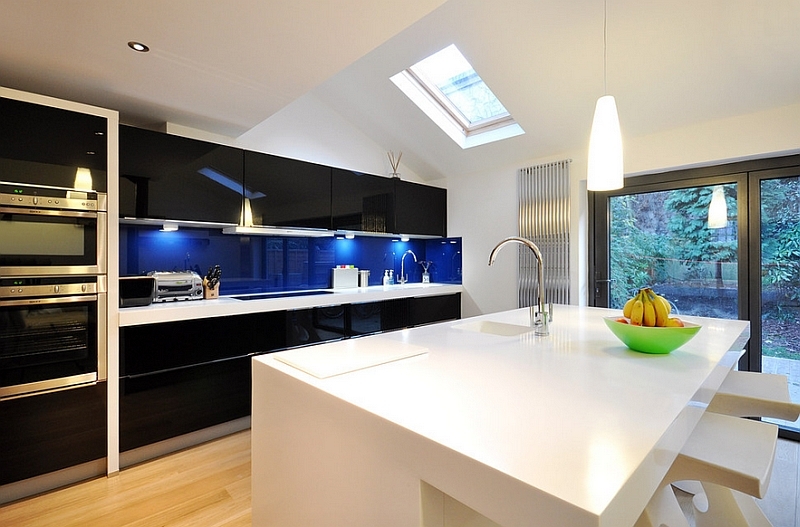 A more contemporary version of the blue backsplash is the glossy back-painted-glass version that seems apt for the modern kitchens. 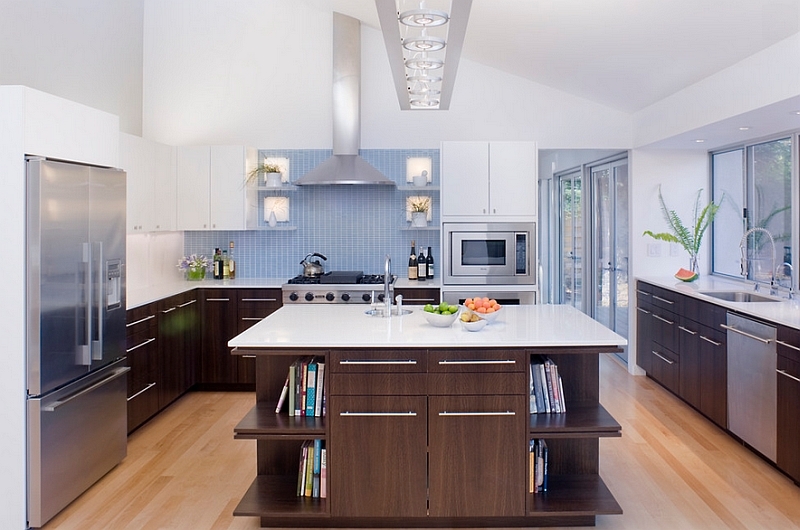 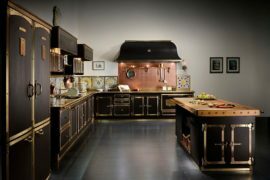 It combines visually with cabinets that sport an equally shiny, lacquered look and serves as the perfect dose of accent color. 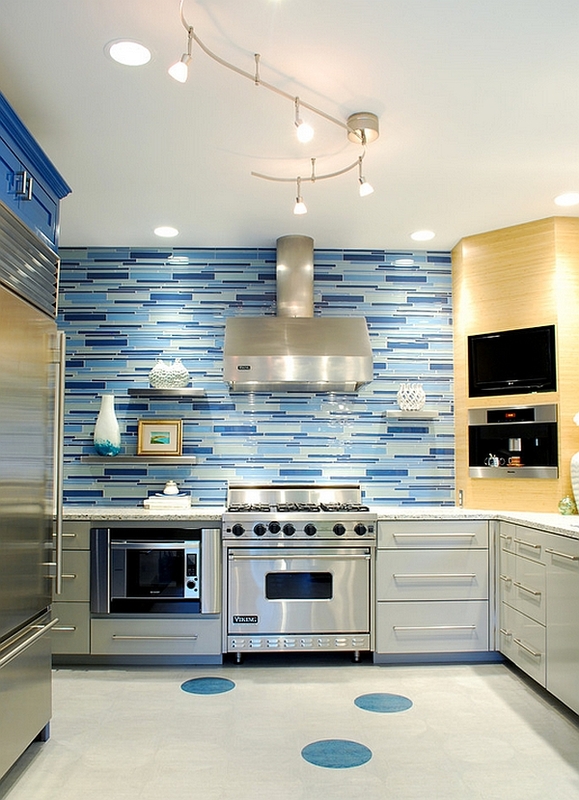 You can even combine tiles in several different shades of blue to create a custom backsplash that becomes an instant focal point. 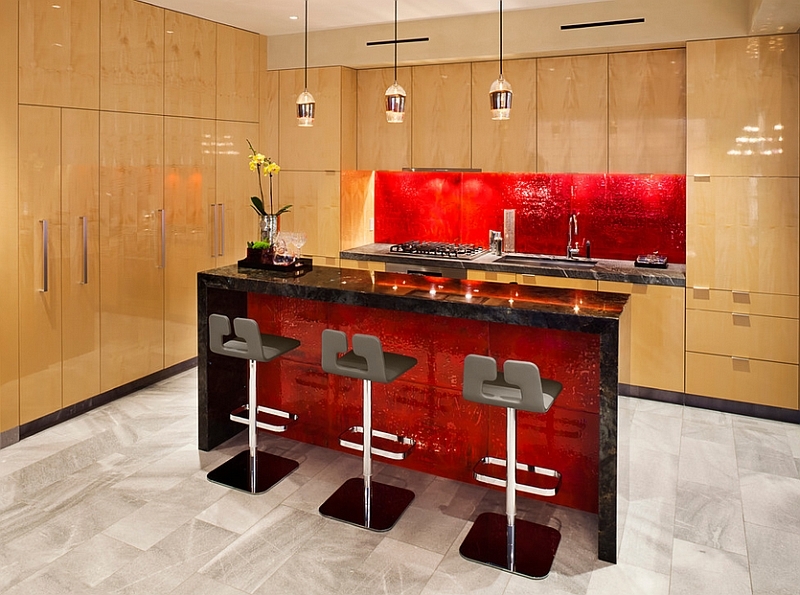 Fire up the Kitchen with some Reds! 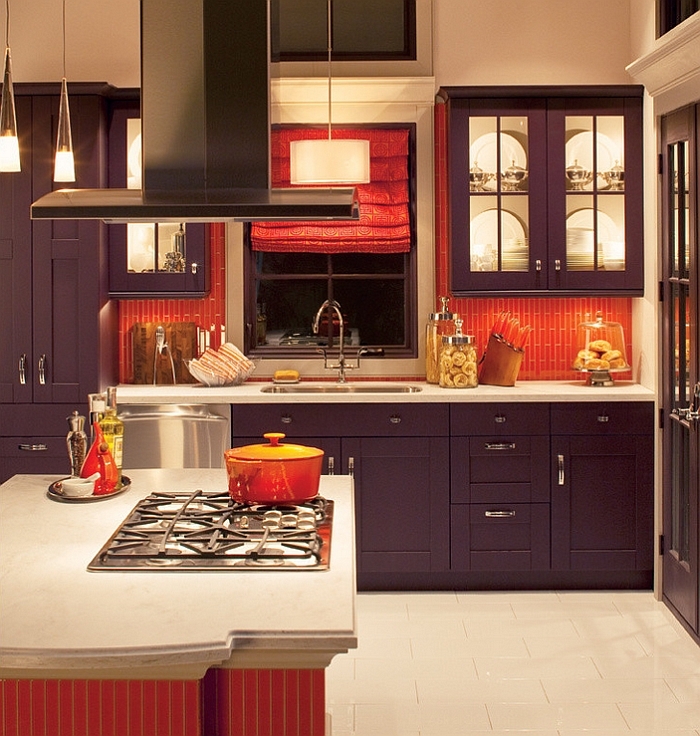 We move on from beautiful blues to ravishing and energizing reds that seem to dominate any room they adorn. 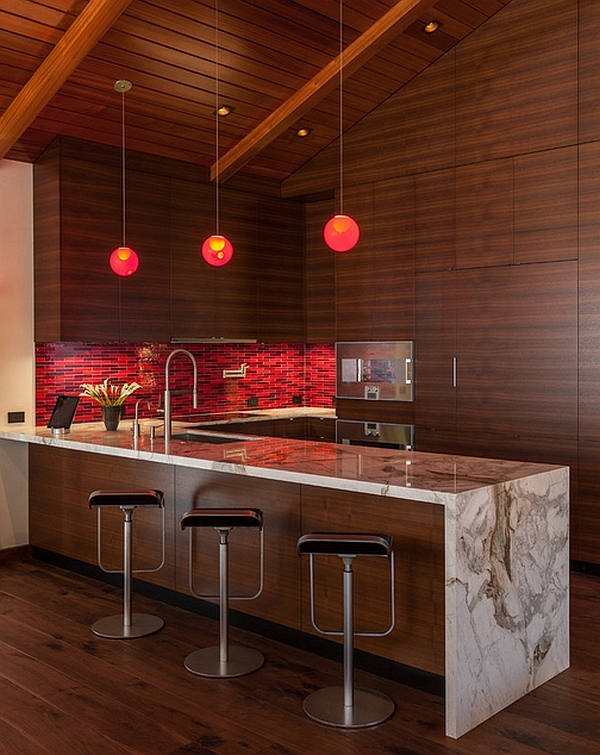 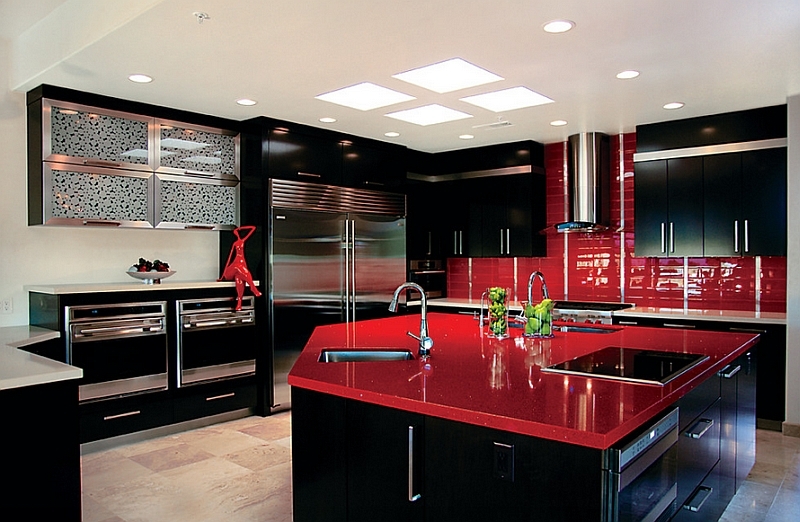 Despite all its brilliance, red can be a tricky color to work with in the kitchen. 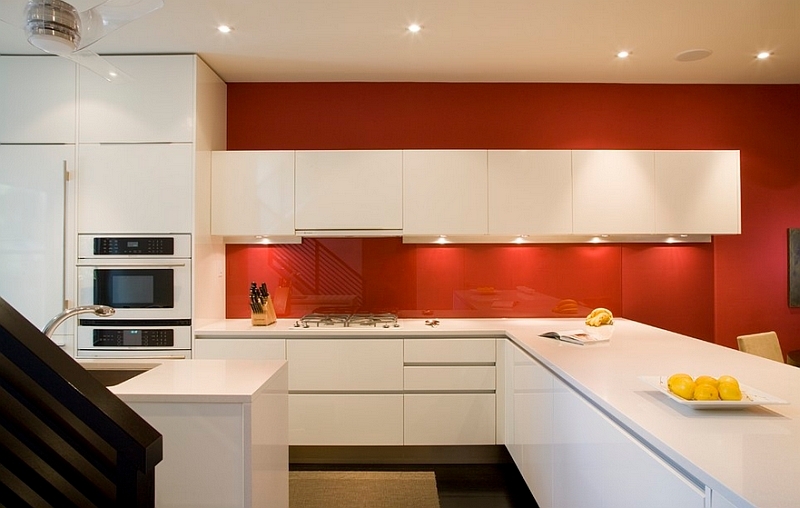 If you are going for a serene and tranquil look, it might be best to stay away from red. 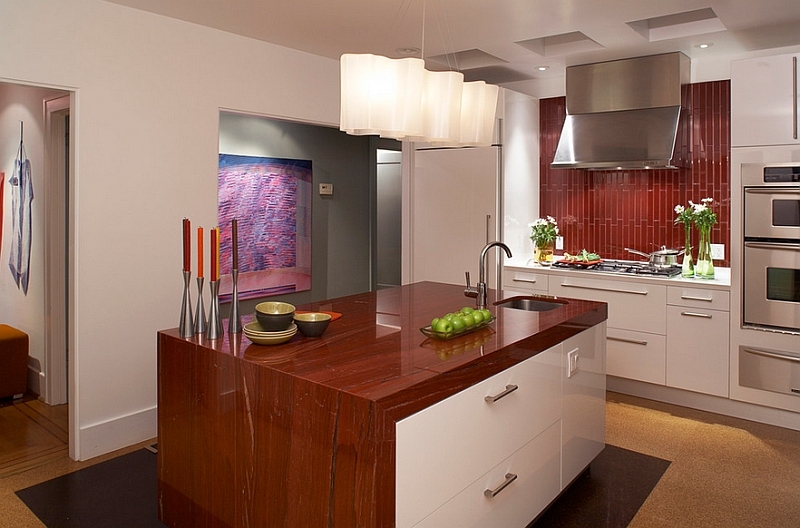 But if you are trying to breathe life into a dull kitchen, nothing works like the captivating and bold red backsplash. 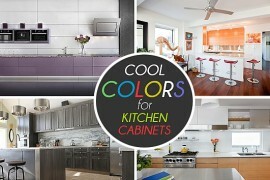 The key here is to use the color in a restrained and sparing fashion. 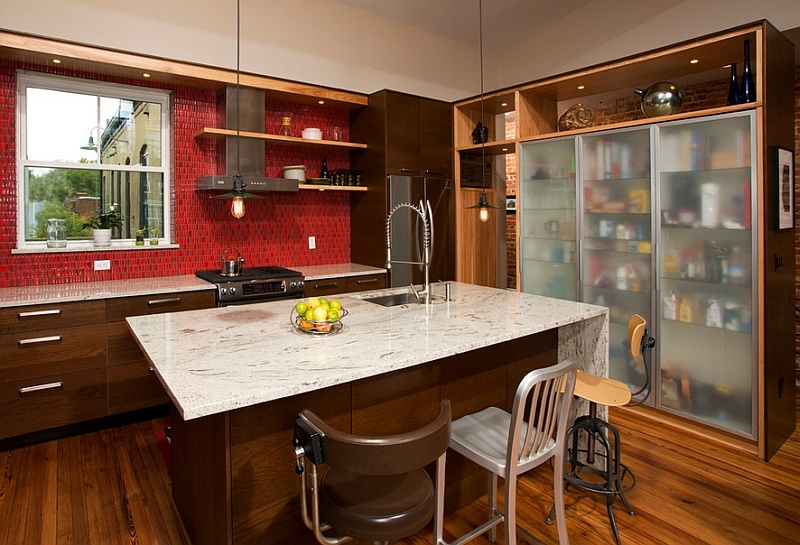 Apart from the backsplash itself, keep additional red accents to a minimum. 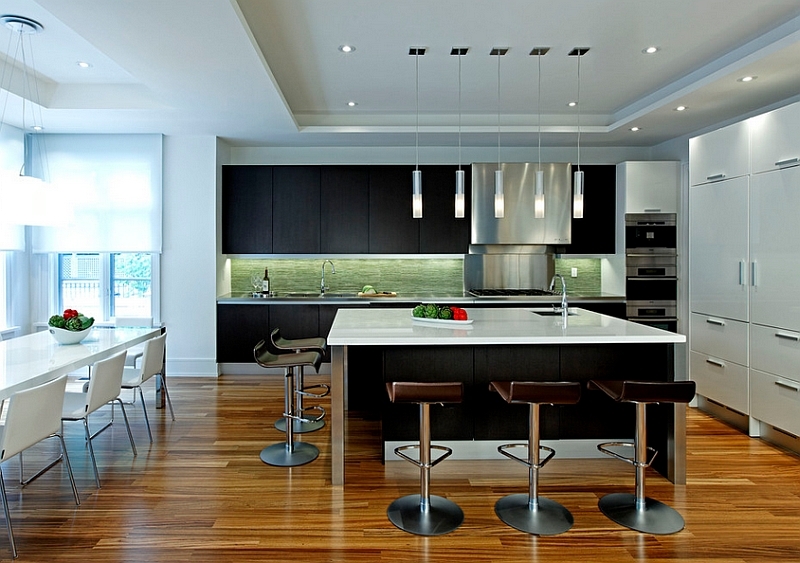 A few pendant lights or some fine kitchenware displayed elegantly will suffice. 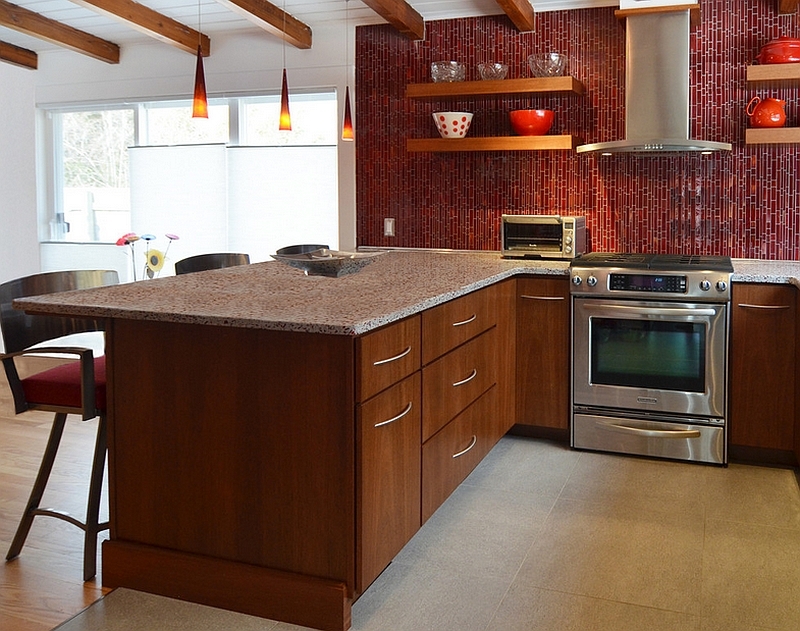 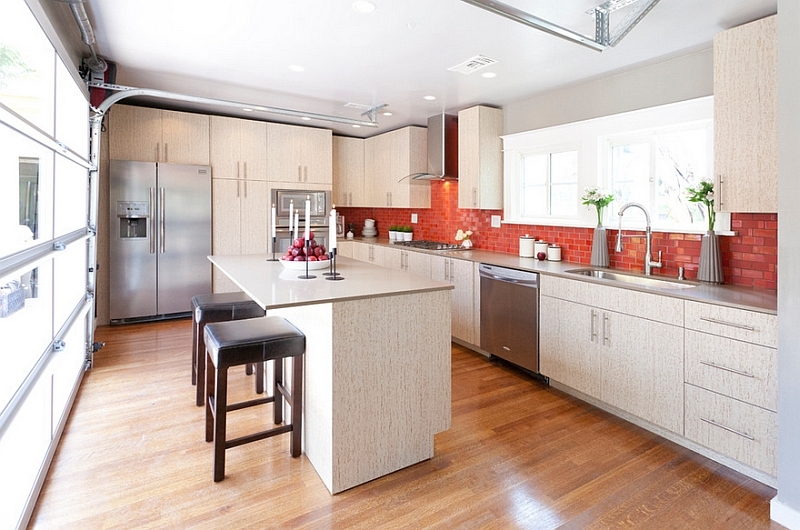 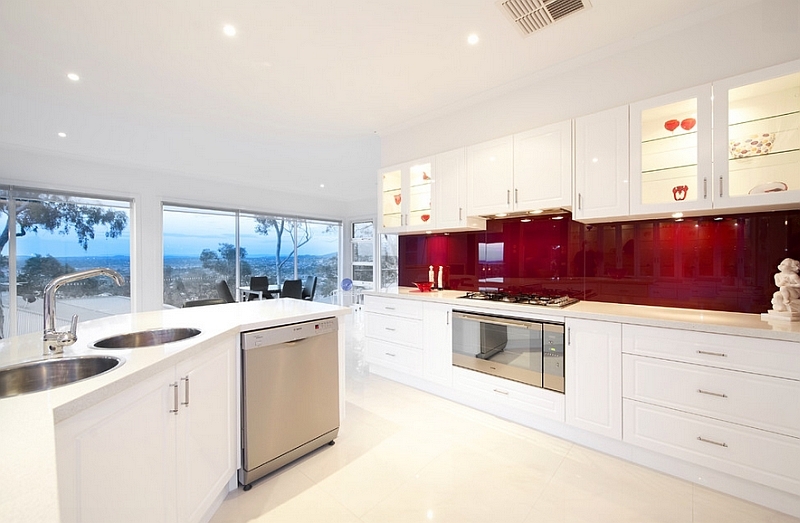 Red is a natural backsplash choice in most contemporary kitchens that use white cabinets. 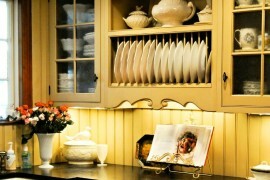 The combination is both incredibly popular and universally embraced. 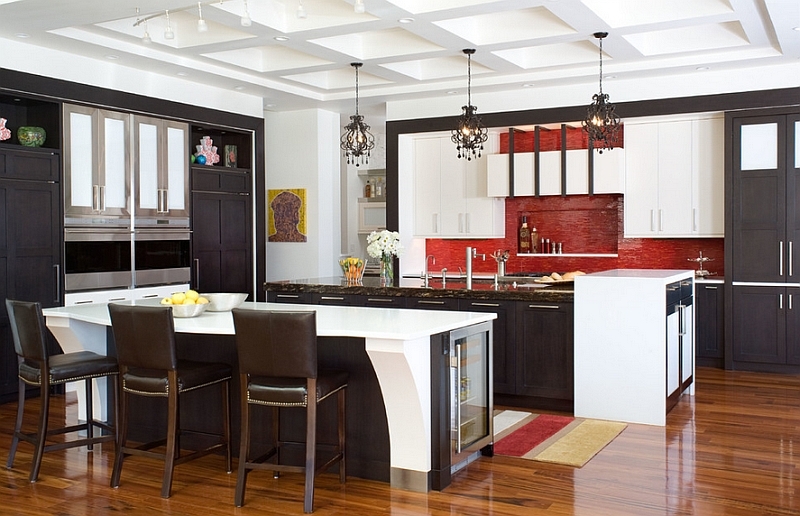 Add a touch of black to this color scheme if you wish to fashion a more lavish or even oriental appeal. 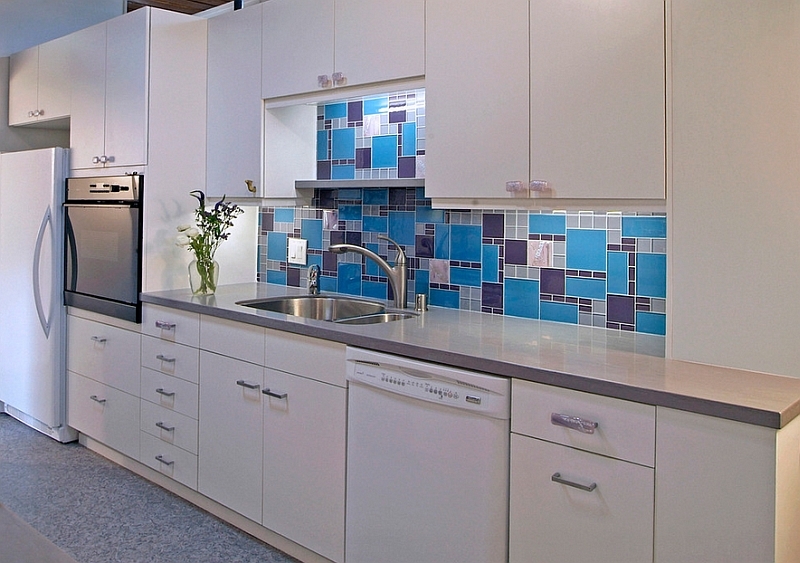 Opt for glass mosaic tiles or low-maintenance back-painted glass for the backsplash to achieve the best results. 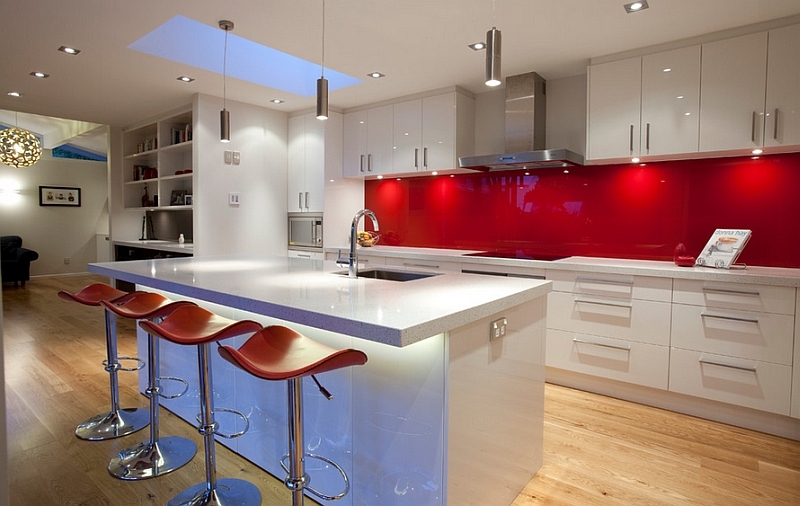 Also make sure you get the lighting spot on when using red in the kitchen to eliminate any sense of darkness. 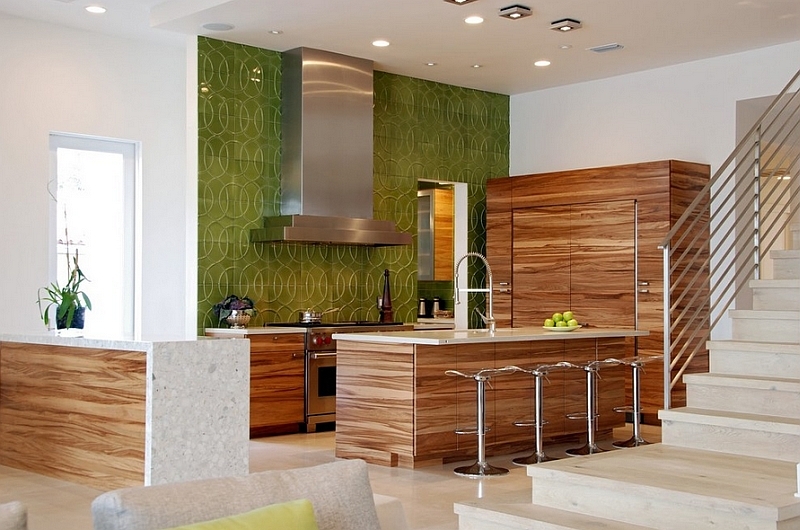 Green is a hue that has suddenly started dominating color palettes around the world in the last few years as homeowners are turning toward more nature-centric themes. 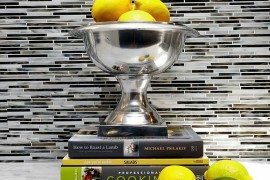 Combing a green backsplash in the kitchen with organic materials such as bamboo and accents like potted plants is both easy and natural. 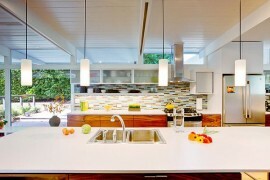 It also visually represents one’s desire to make a shift toward an interior that is more eco-friendly and sustainable. 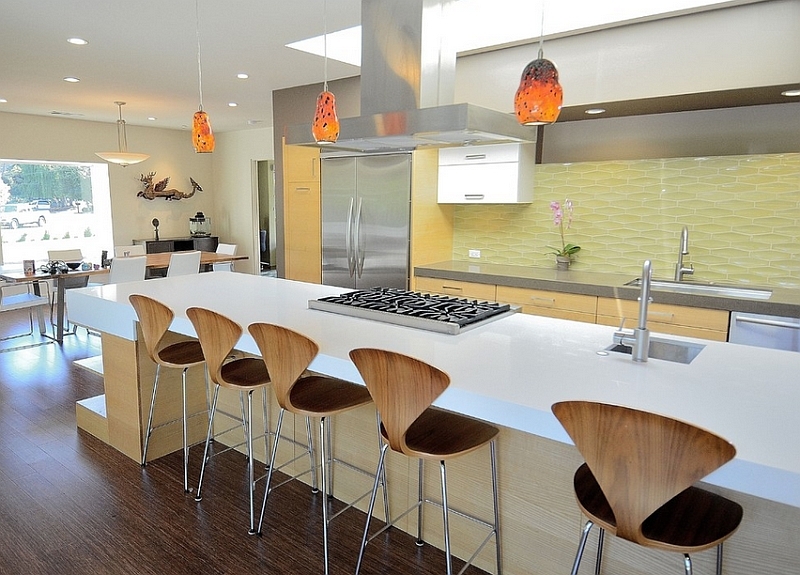 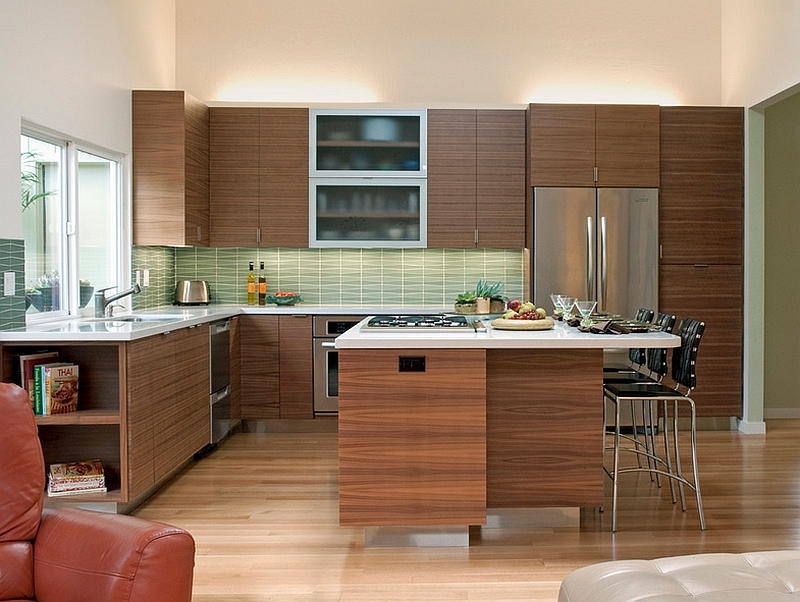 Consequently, most backsplashes in this color tend to embrace restrained leaf tones. 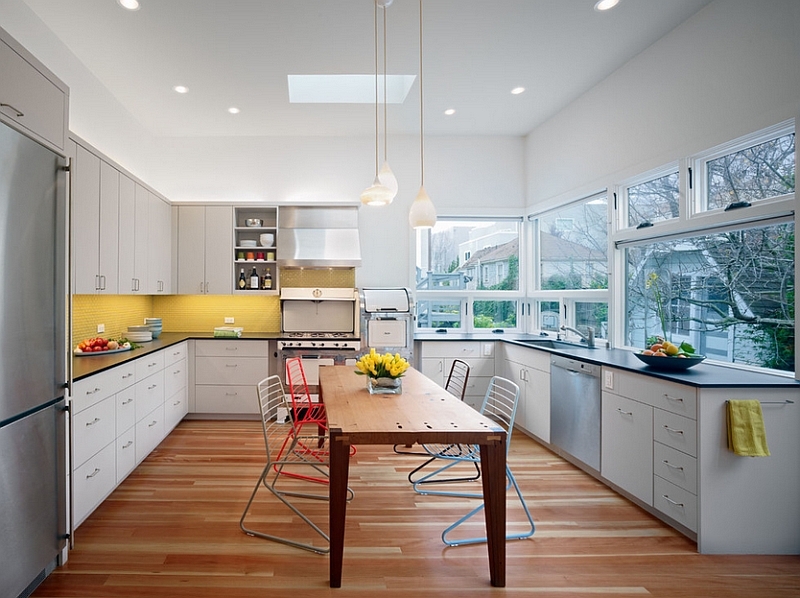 This also allows you to easily turn the kitchen into a natural extension of the backyard or the scenic landscape just outside the window. 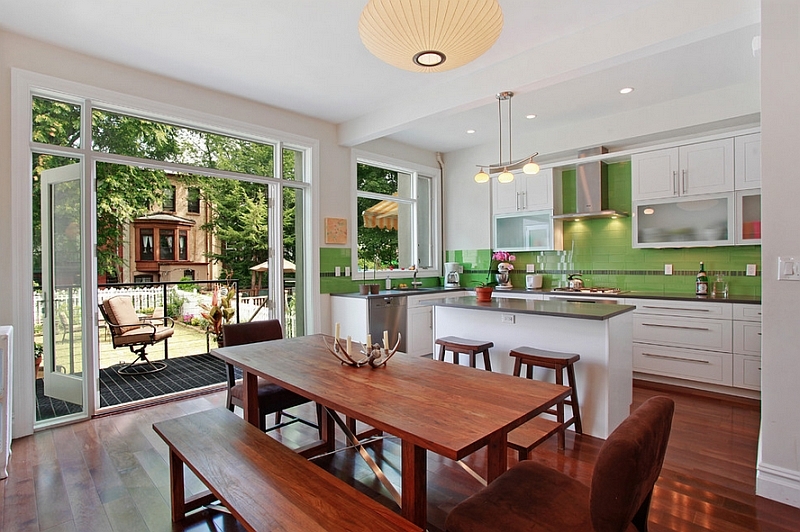 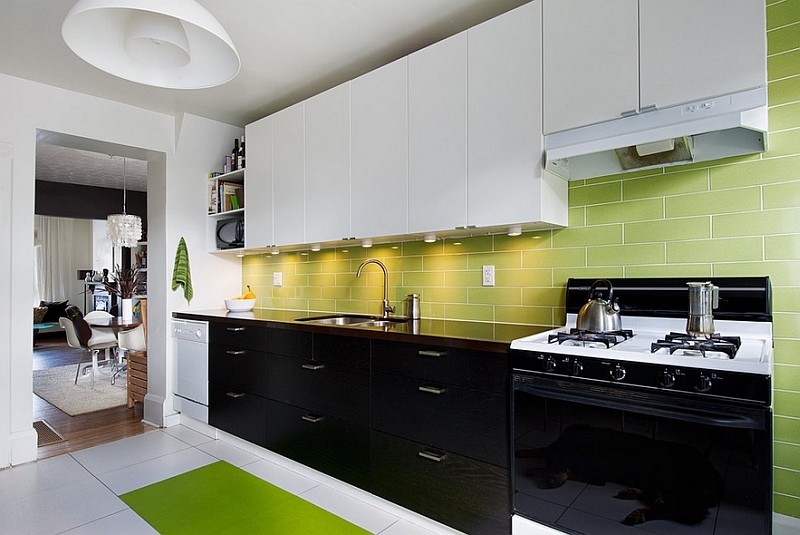 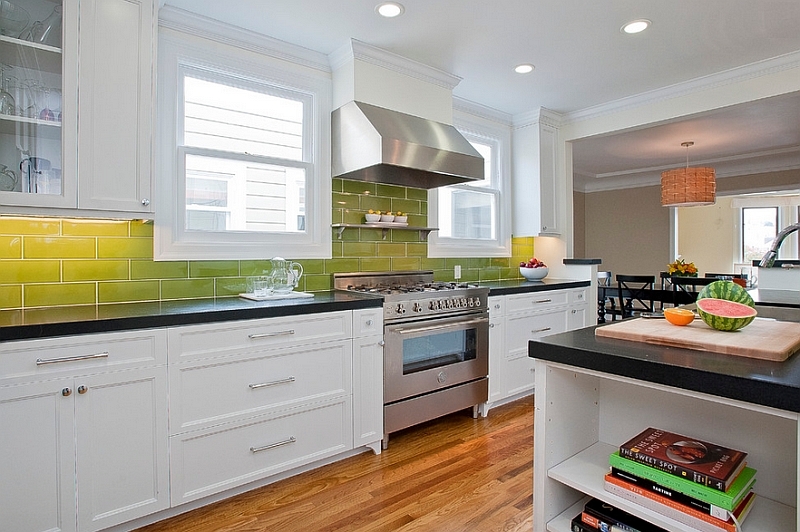 Lime green is another backsplash hue that tends to turn heads with ease. 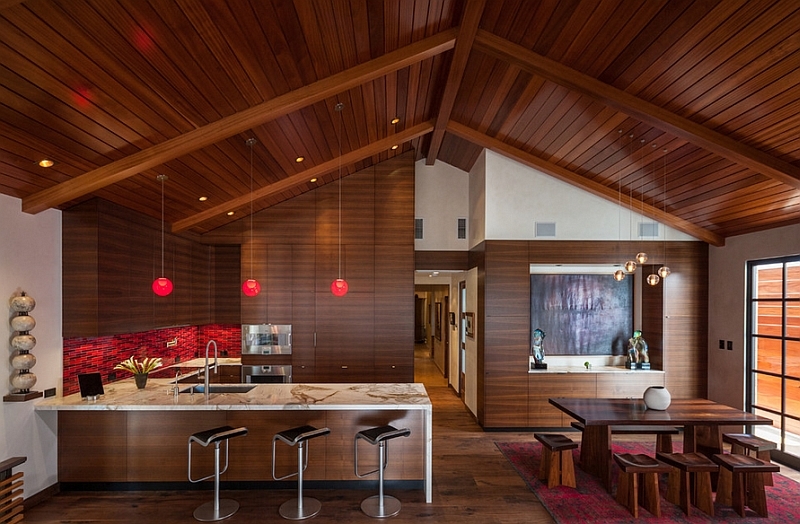 Despite adding vitality to the room, it looks both understated and pleasing. 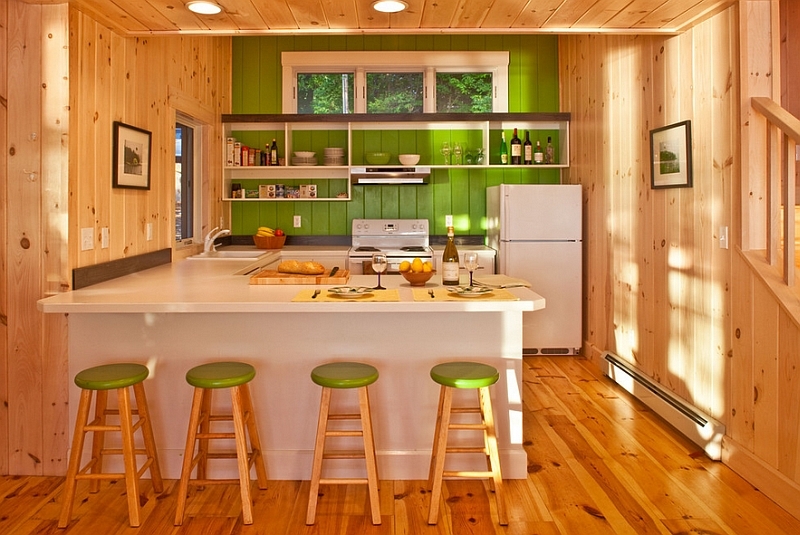 This makes lime green an ideal pick for those who are not too fond of bold color in their kitchen, yet would love to infuse some visual richness. 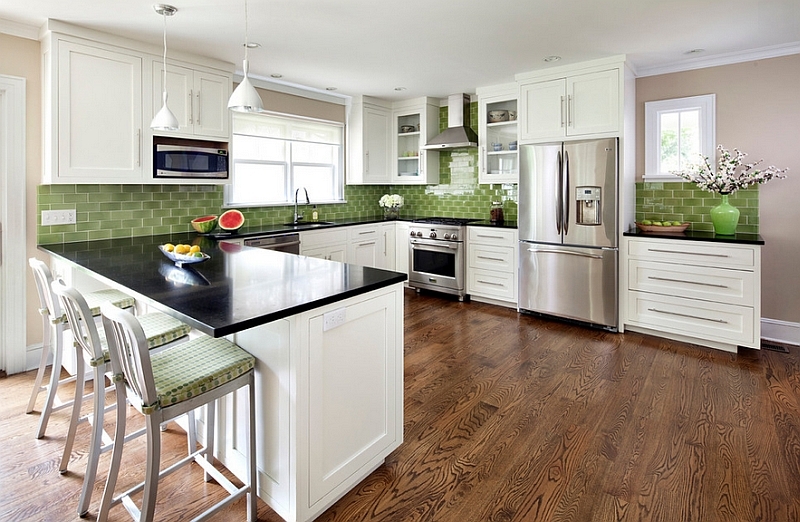 Mix these gentle greens with wood tones and you have a truly relaxing kitchen. 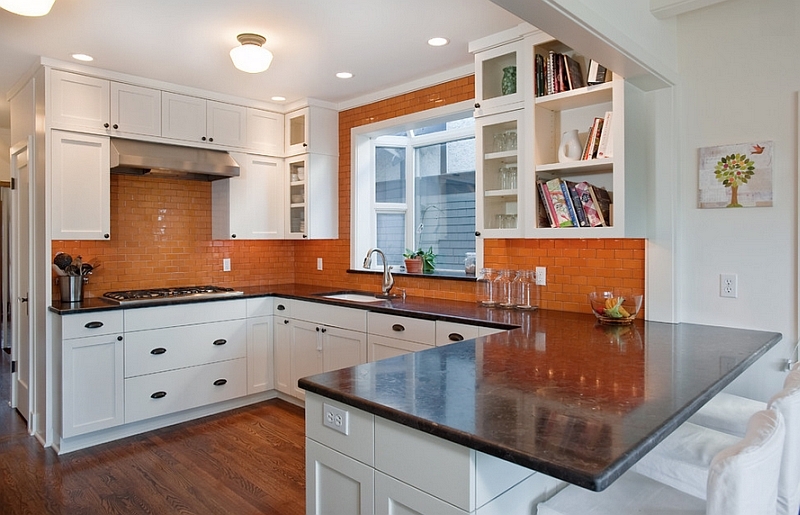 A decade or so ago, most of us would have struggled to consider orange as a viable backsplash color for the modern home. 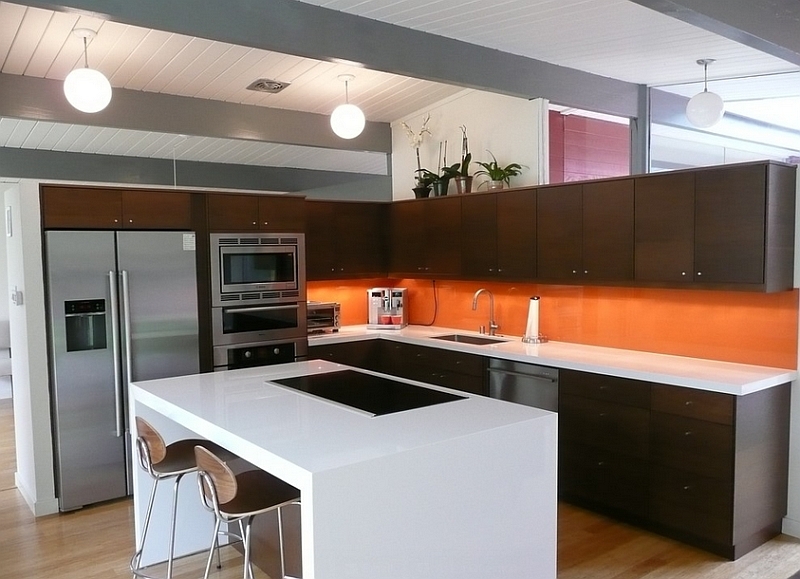 We thought that funky orange had its time under the spotlight in the swinging ’60s and ’70s and the world would now embrace the creams and the beiges. 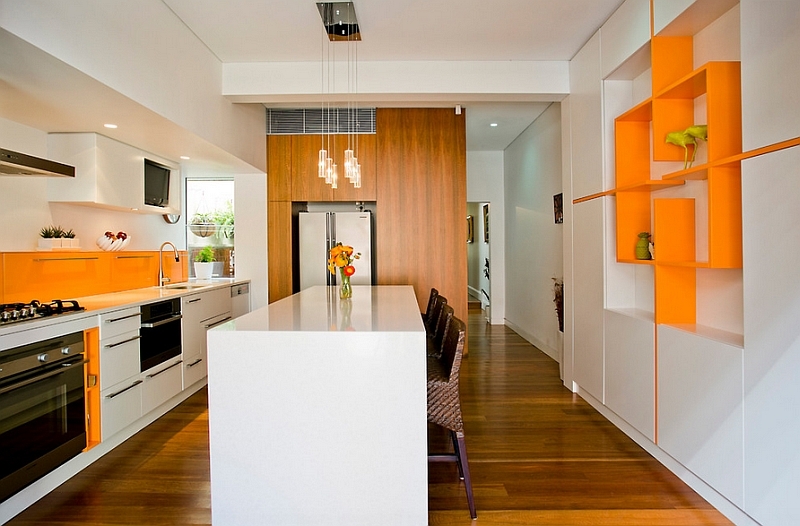 But orange has made a magnificent and stylish comeback as an accent hue. 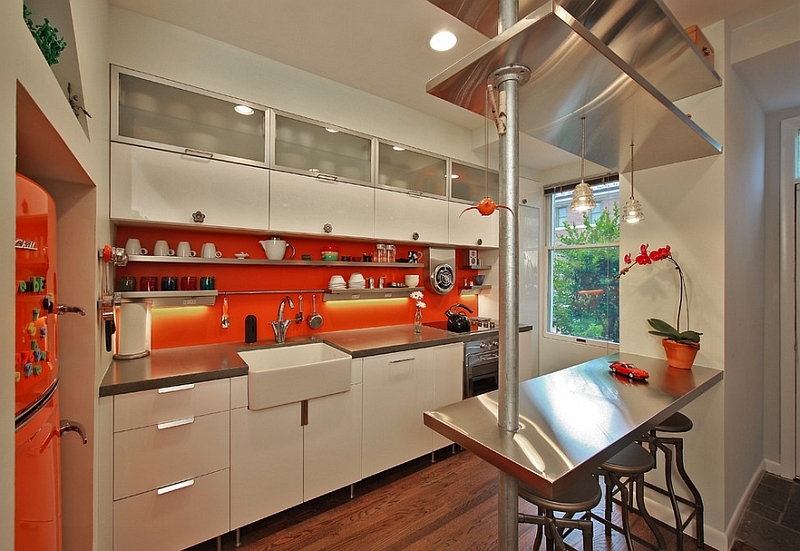 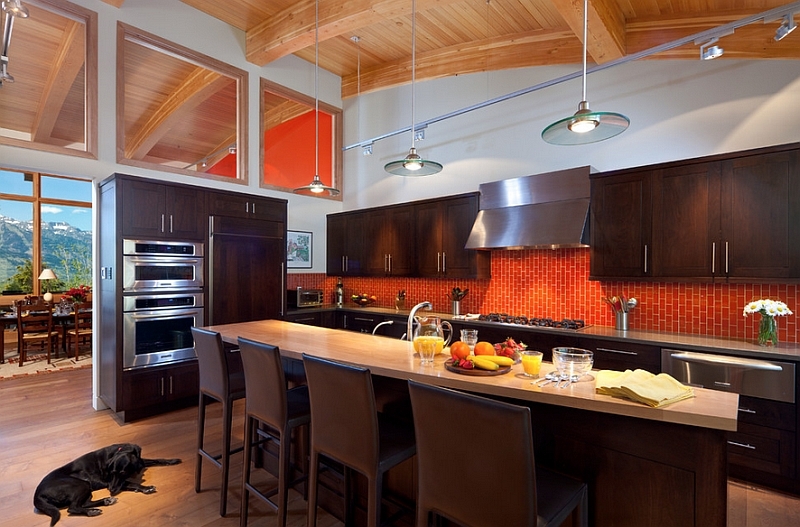 Most designer kitchens today carry the spunky orange backsplash option. 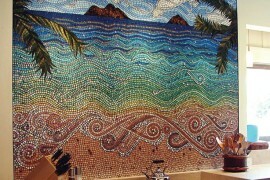 It has become synonymous with self-expression, joy and unabashed personality. 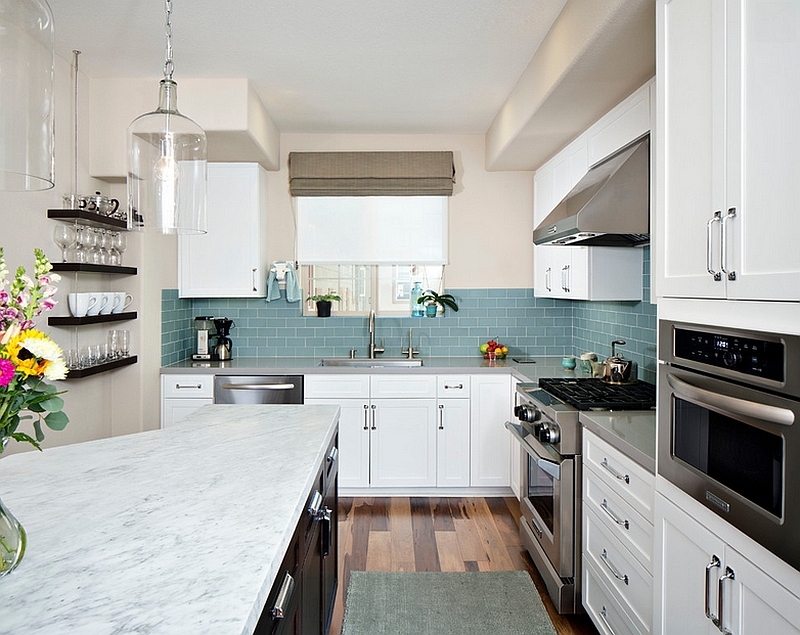 A backsplash in this color is right at home in kitchens with retro, contemporary and Mid-Century modern styles. 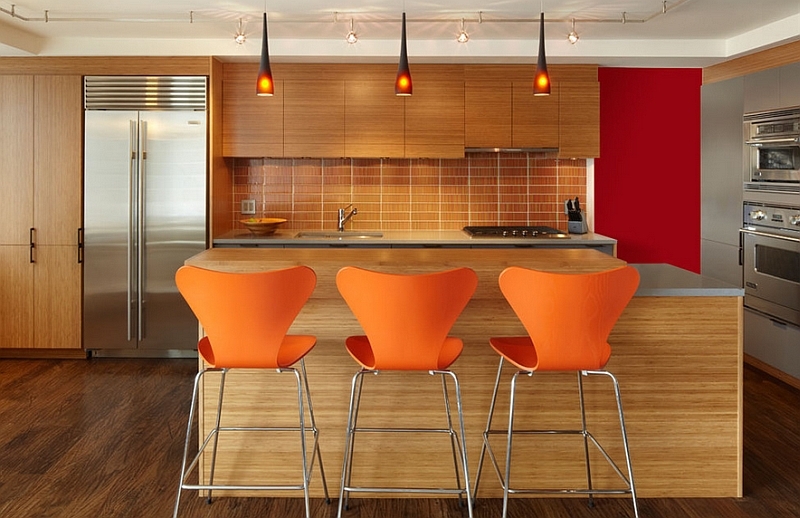 Orange brings the audacity of red and the warmth of yellow together. 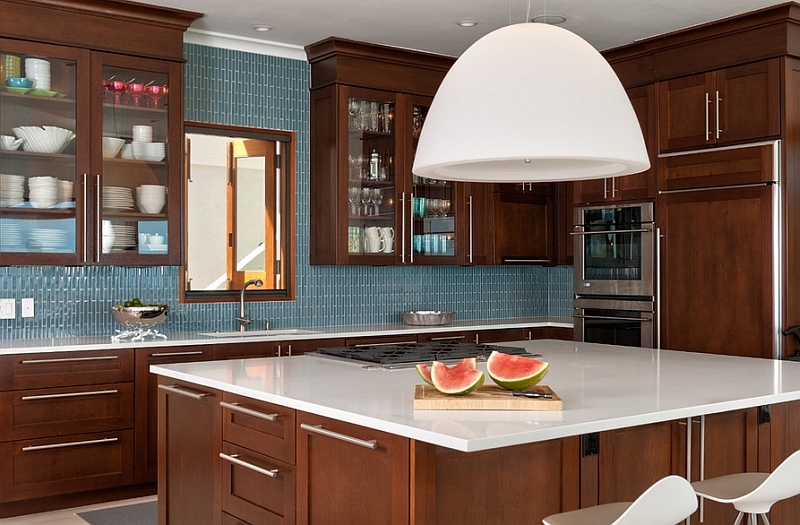 Vary the lighting and you can even create an ombre effect with the backsplash without actually using varied tiles! 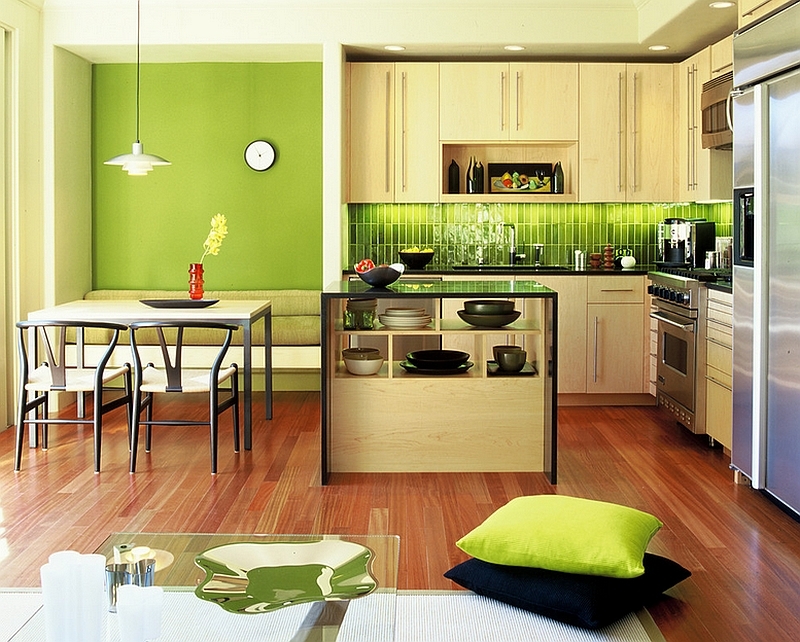 Since it is such a strong color, it is best to repeat it in more than one place to lend greater balance to the room. 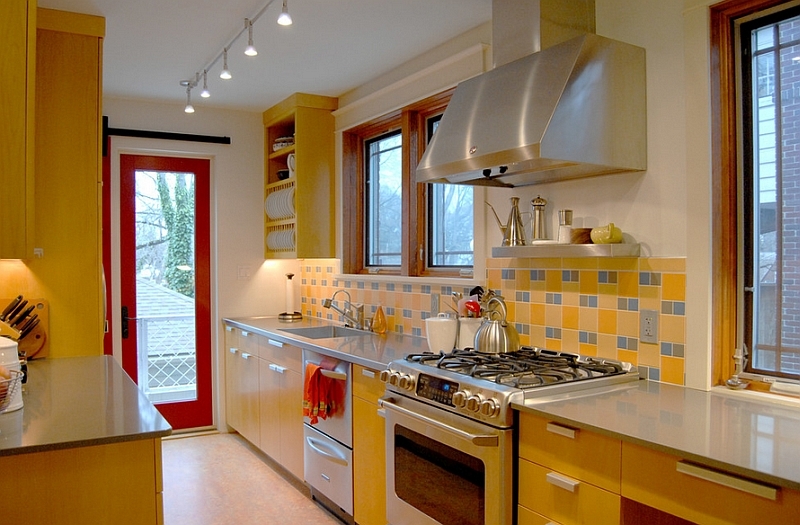 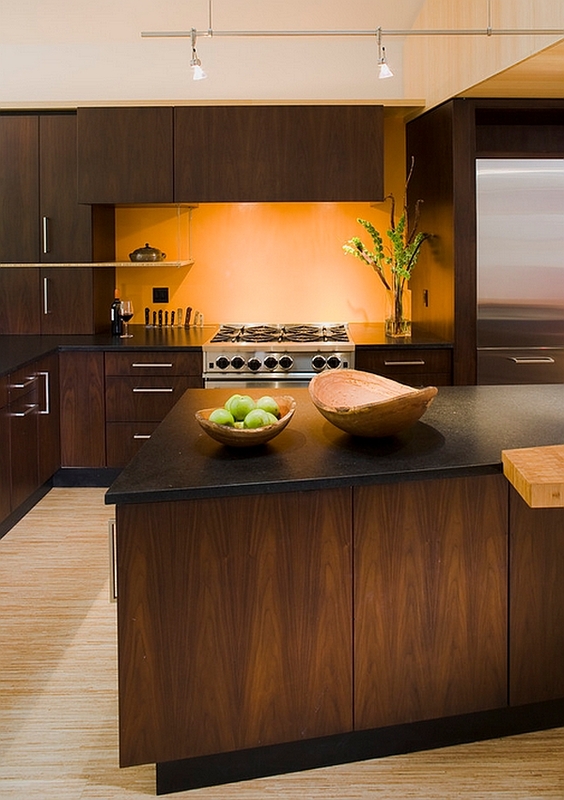 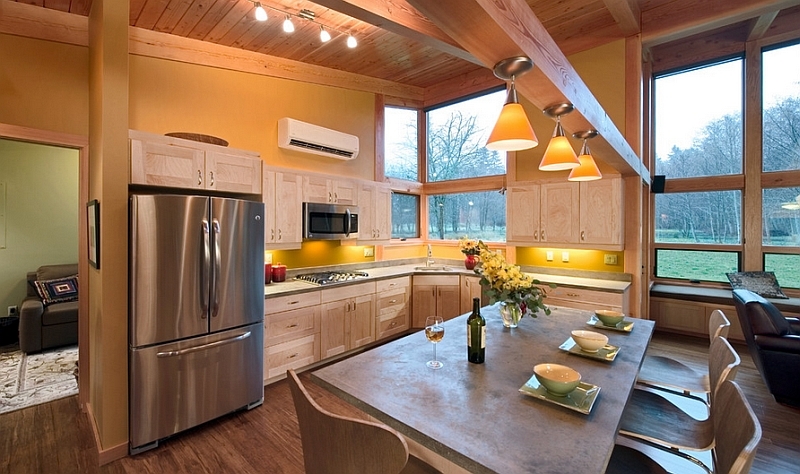 Also, keep the rest of the kitchen as neutral in shade and uncluttered as possible to let orange shine through. 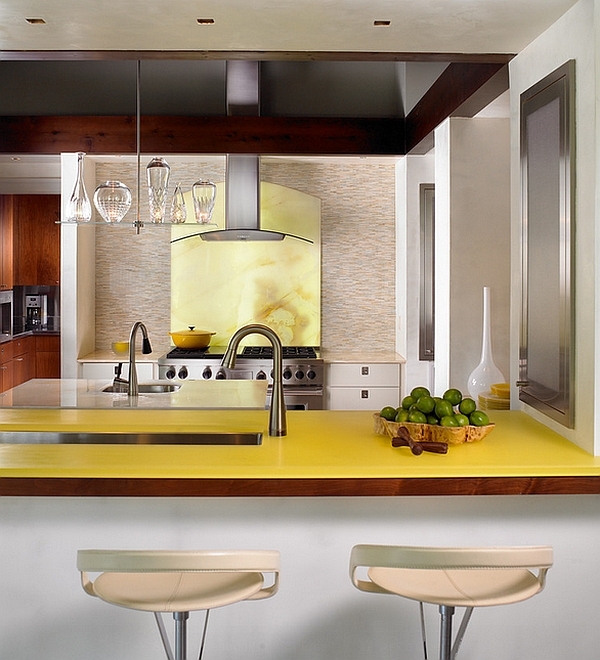 While yellow is not as popular as the other colors on display here, the right yellow backsplash beats pretty much every other hue with sheer freshness and a warm, fuzzy glow. 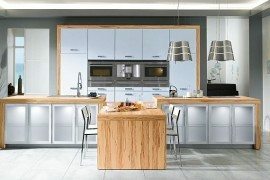 Its radiant beauty will help kickstart your day on the right note as it spreads cheerfulness and drives away the morning blues. 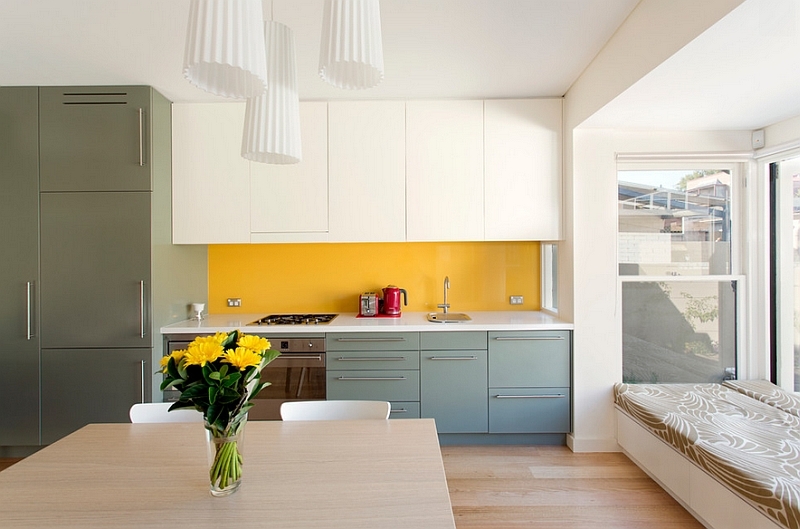 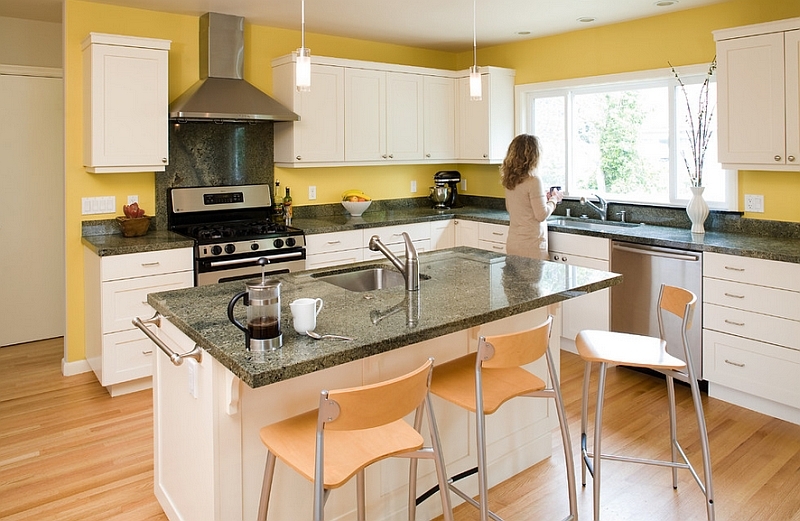 Mustard yellow backsplashes look splendid in modern kitchens, while the subtler shades like sandy yellow are far easier to pull off in pretty much any setting. 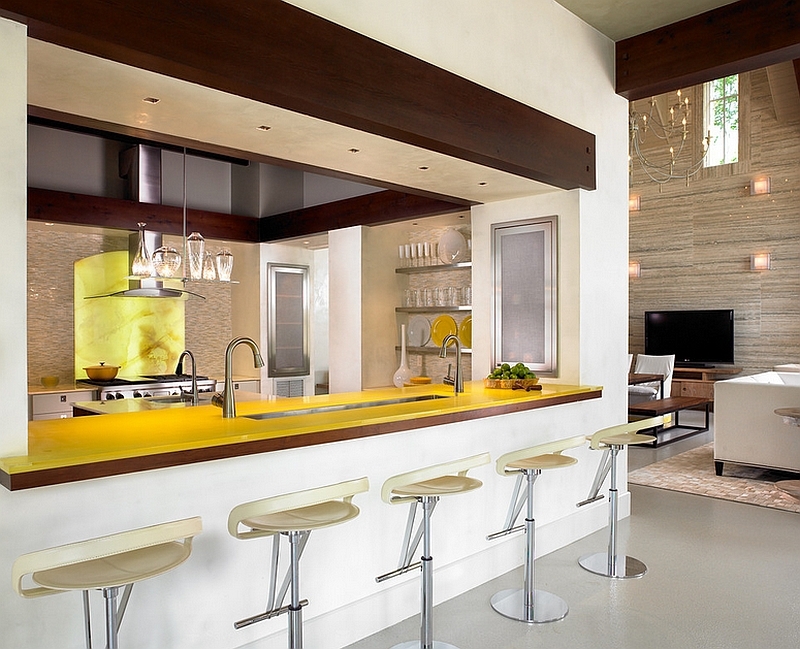 Fresh yellow flowers on the kitchen island and maybe a few accent chairs in the adjacent dining room complete the lively ambiance that yellow backsplashes bring. 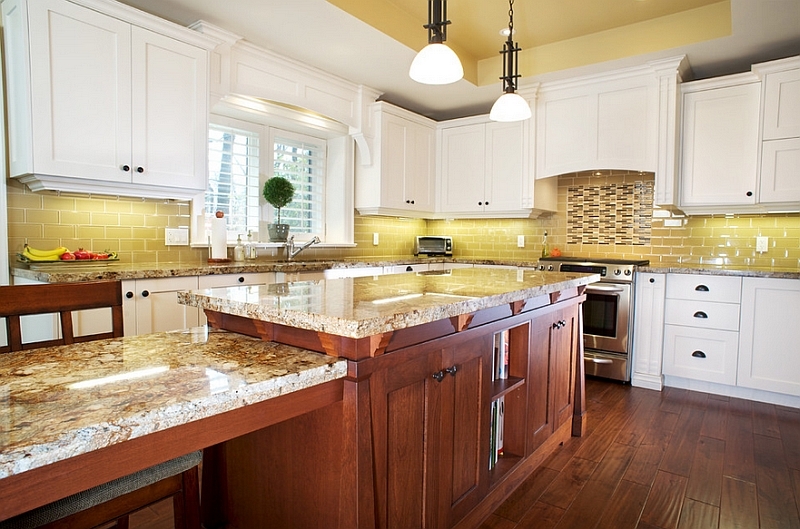 Whether it is yellow or red, blue or green, never forget the importance of both focused and recessed lighting when picking a backsplash. 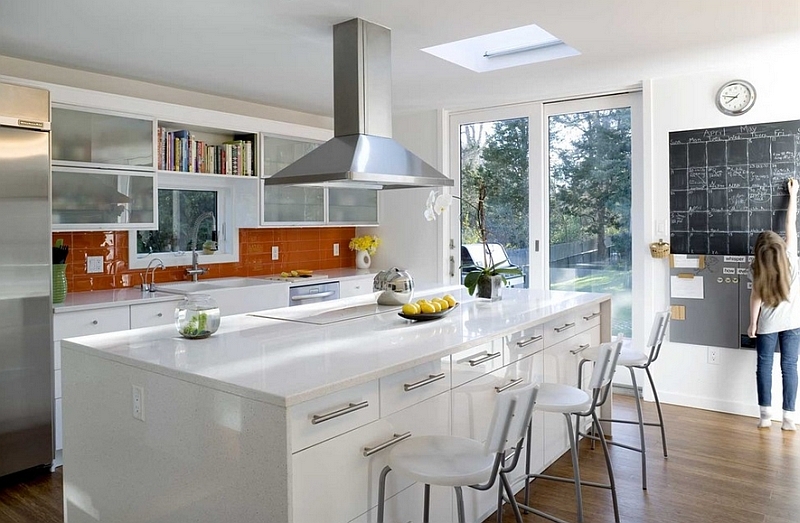 Also take into account any natural light that is available and how it might affect a glossy, back-painted glass backsplash with unnecessary glare. 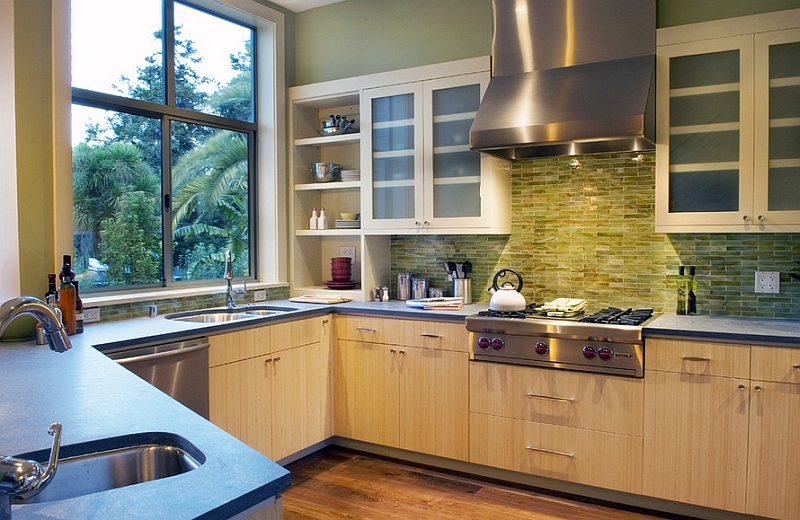 The perfect backsplash is the one that seems like a natural extension of the kitchen itself.